CropStop: Follow Up Friday...Visions of Sugarplums! Follow Up Friday...Visions of Sugarplums! Vicki here...Thanksgiving has come and gone and with December's arrival, we are moving "full speed" ahead into the Christmas holiday season. My Christmas cards are finished and postal! So excited to be done on time this year. Today I am sharing the final design of 4 different cards that I created. 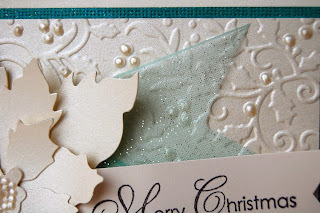 I used winter white with two different colors of cardstock and love how they turned out! All of the cards were made with Core'dinations cardstock base and matting. 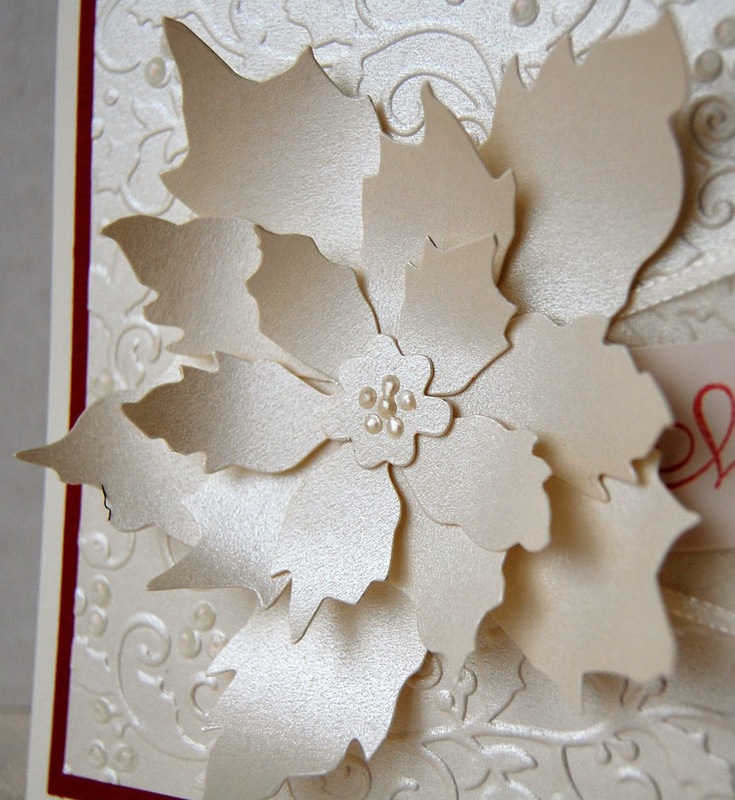 The embossed paper is Recollections and has a shiny satin sheen. 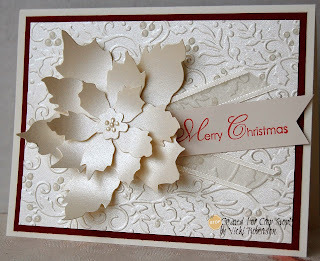 Once again, I have used my Couture Creations Sugarplum Ball Embossing Folder. I have many Couture Creation Embossing Folders in my stash, but I must say that this is currently my very favorite folder. The design is both intricate and elegant. I used it for the Thanksgiving cards that I made too. 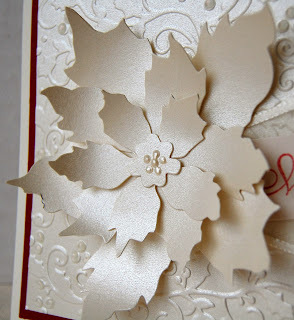 After embossing and assembling the front of the cards, I added berries using a Viva Décor Pearl Pen in cream color. There's nothing better than these Pearl Pens for adding a decorative touch to any craft project. Easy to use and they dry fairly quick. 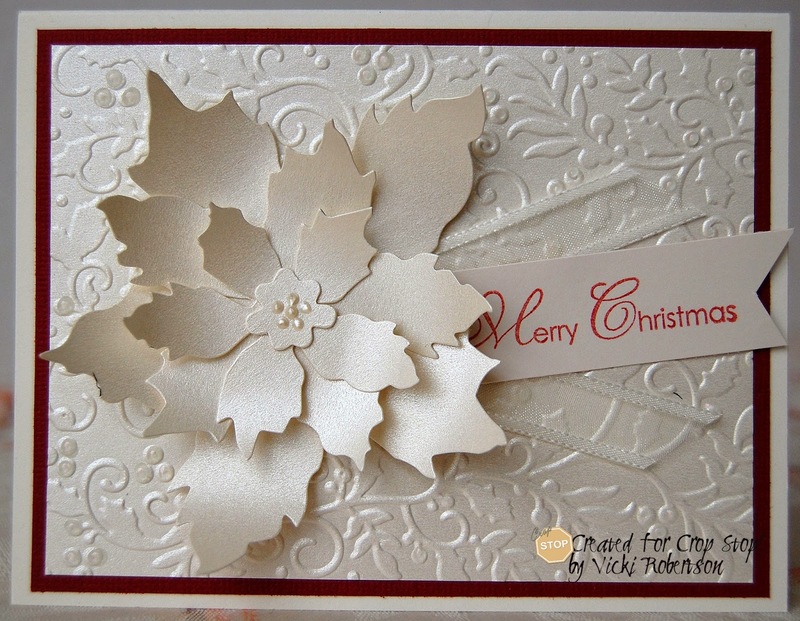 I used the Tim Holtz Tattered Poinsettia Die-cut as the focal point and used the Pearl Pen again for the tiny flower center. The sentiment is stamped with Memento Ink on a Spellbinder Pennant Die-cut. I added shimmery turquoise ribbon under the sentiment to help bring it forward from the background and sprayed the card front except for the poinsettia with a coating of Therm-O-Web Iridescent Glitter Dust. 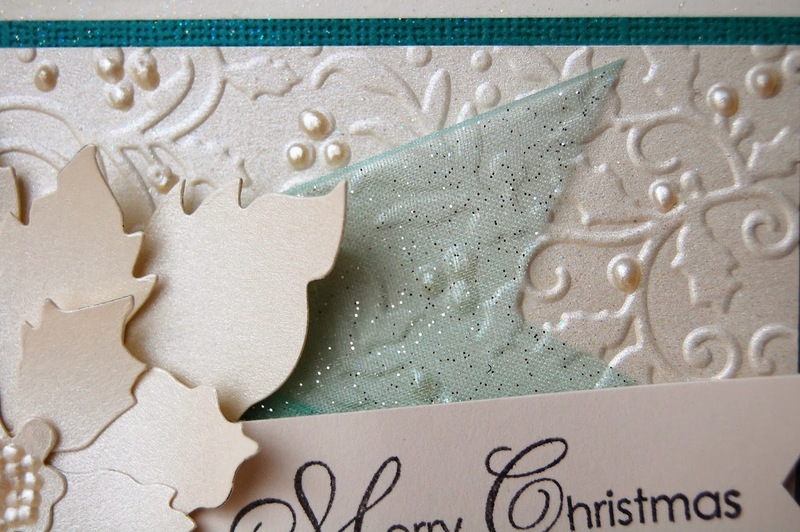 The Glitter Dust adds a bit of extra sparkle to the card although it is difficult to see in this photo. 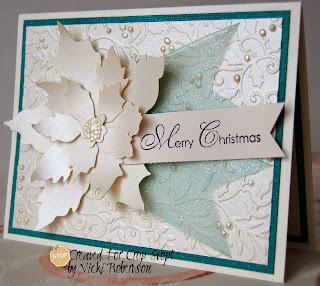 Here's a close up of the embossed design and pearl berries. 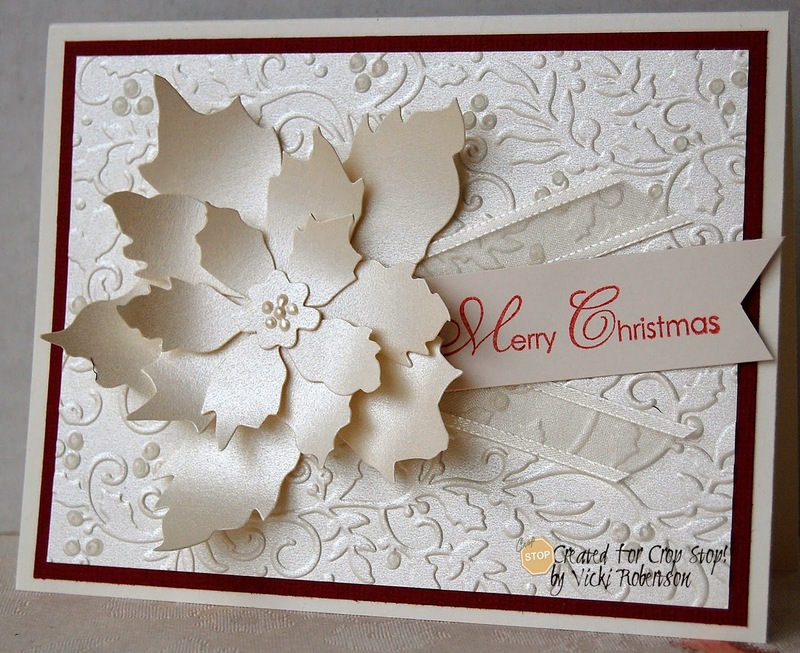 The second card is similar in design using dark red cardstock and ivory ribbon. 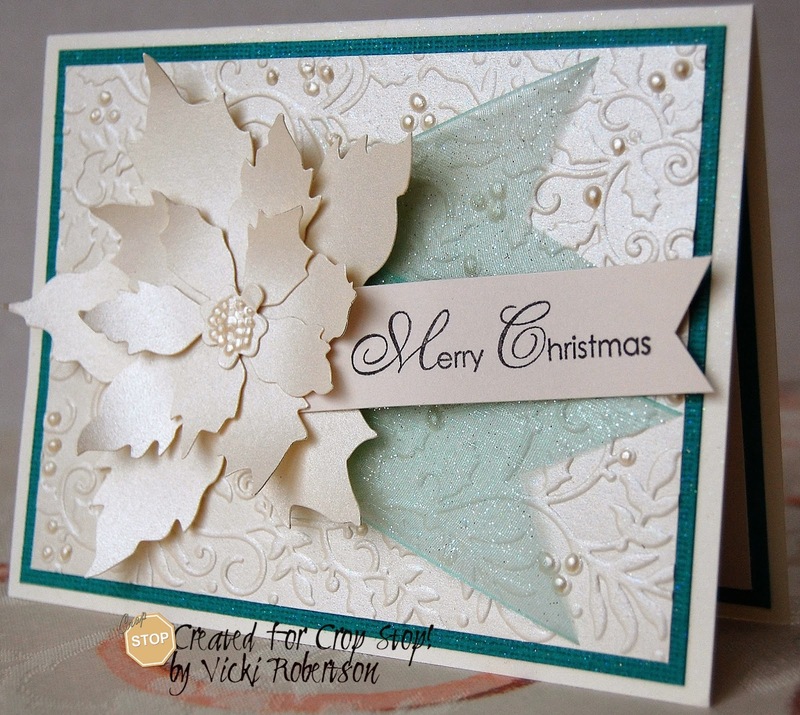 I die-cut and curled the edges slightly upward on each layer of the poinsettia. 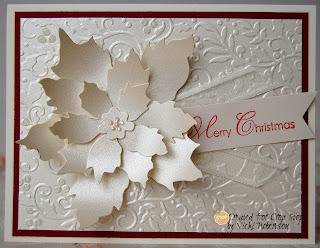 The Tim Holtz Tattered Poinsettia Die-cut is fabulous! I kept the flower very plain because I wanted simple and elegant, but I can't wait to try some tulle or fabric in between the flower layers. 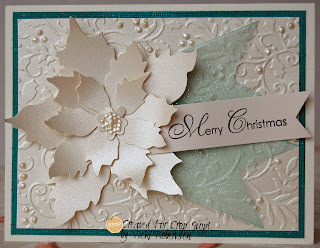 Again, I used the Viva Décor Cream color Pearl Pen for the tiny flower center. I hope you enjoyed my Christmas card inspiration. Shop at CropStop, the stopping place for paper crafters, card makers and scrapbookers! 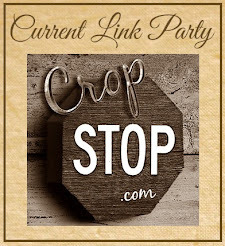 See our Santa's Instructions page for help with your holiday shopping!